I’m going on the road at the end of the month and have been looking for ways to consolidate and lighten my load to avoid the inconvenience and expense of checked baggage and, worse yet, lost baggage. In this era of fascination with travel, however, there are many innovative and wonderful things available to accomplish that. As a savvy PR guy, of course I subscribe to Peter Shankman’s Help A Reporter Out, or HARO. 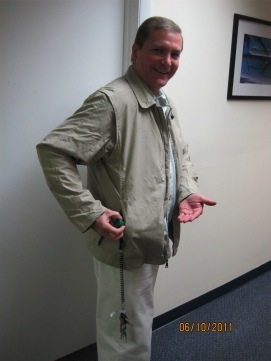 For years Shankman has been extolling the virtues of Scottevest travel clothing — jackets, vests and pants with pockets galore. I was especially impressed when Shankman took a four-day trip to China and carried no luggage, just wore Scottevest clothing with pockets stuffed with everything he needed. So I took the plunge and ordered a Scottevest jacket with removable sleeves because Venice in July is brutally hot, like Miami, and I thought it might work better as a vest, but would still provide me with flexibility for cooler climes. Of course, my co-workers just thought I was just being quirky again. The jacket arrived today, and my colleagues were singing a different tune. 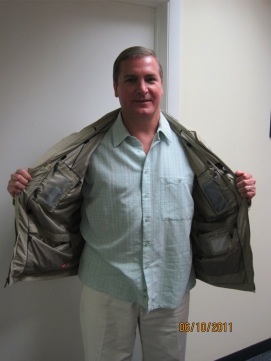 While we all agree that I’m not going to win any fashion shows in my Scottevest, they couldn’t wait to load up the pockets with all the stuff pictured in a cool “X-ray” image of the jacket. In went my MP3 player (the jacket has a special pocket for that with cord guides so the earphones don’t get tangled), my e-reader (to replace the three or four books I always travel with), camera, keys, tissues, hand sanitizer, wallet, water bottle — virtually everything I would usually carry on in a valise — and everybody tried it on to see how it felt. Here's all the stuff we put in the jacket. The results — everybody (including me) thought it was very cool. 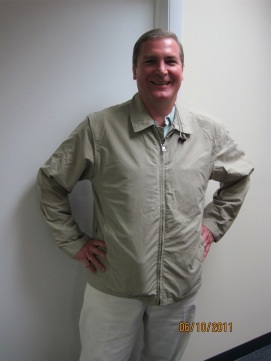 The jacket is balanced very well, so that even with all of the stuff squirreled away in umpty-dozen pockets, it is comfortable. 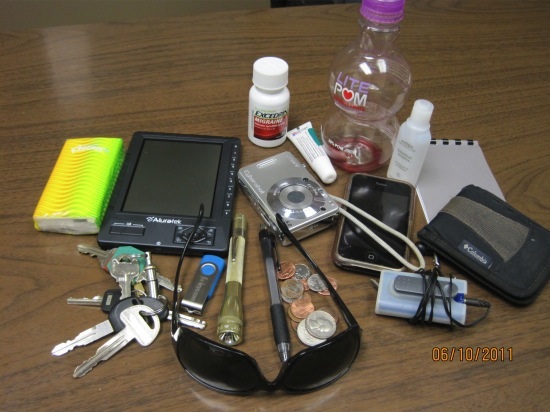 Everyone agreed that the craftsmanship is exceptional, and it has thoughtful accessories, like a water-bottle strap to keep the bottle upright inside your pocket, a retractable keyholder and in the glasses pocket, a built-in lens-cleaning cloth on a string. Thanks for the great review, Buck! 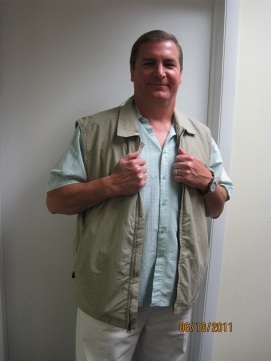 When you hit the road, send us some photos wearing your SCOTTEVEST and we’ll post them on http://www.scottevest.com.